1. 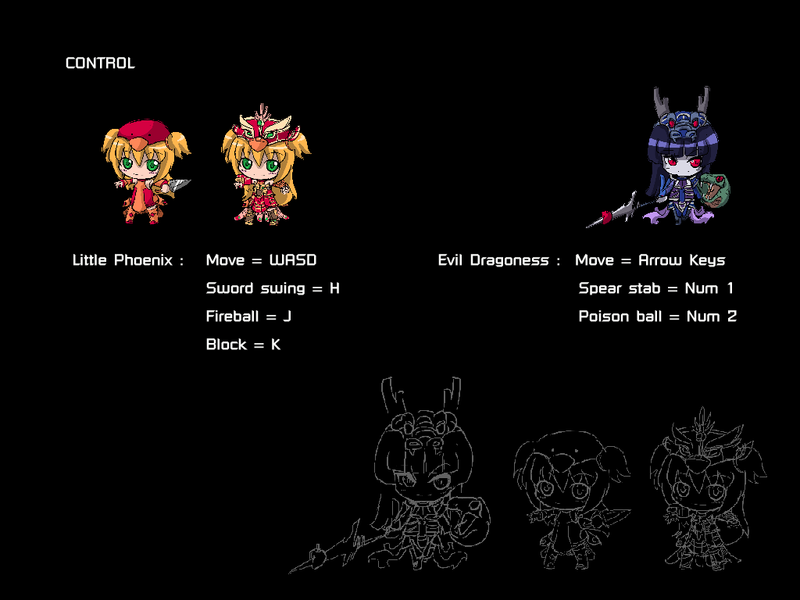 Both players pick a character, one player becomes Little Phoenix, while the other becomes the Evil Dragoness. 2. While Player 1 (Little Phoenix) looks away from the screen, Player 2 (Evil Dragoness) picks the 4 mythical animals that are his/her weakness. 3. Little Phoenix then picks 4 mythical creatures as her allies to aid her in defeating the much stronger Evil Dragoness. 4. In order to defeat the Dragoness, Little Phoenix must pick the right 4 allies to aid her in fighting Evil Dragoness with skill and wit. The more allies she guesses correctly, the weaker the Evil Dragoness becomes! 5. Every time Little Phoenix fails, she will be resurrected to guess the right 4 allies that make Evil Dragoness weaker. 6. For every ally that Phoenix picks correctly, the Evil Dragoness becomes weaker and easier to defeat! 7. Make sure Little Phoenix attempts to defeat Evil Dragoness within the limited time and rounds availabe! Simply run the index.html in your browser! If that doesn't work, upload it to the public folder in your Dropbox folder, copy public link and paste this in your browser?